After spending an amazing amount of time both with Verizon and with Google it appears that pixel 3 XL phones from Google do not currently support RCS. According to Verizon, RCS is only supported on Pixel 3 XL phones purchased from Verizon. Does anyone have any further information? It's enabled on my Pixel 3XL non Verizon model on Verizon. 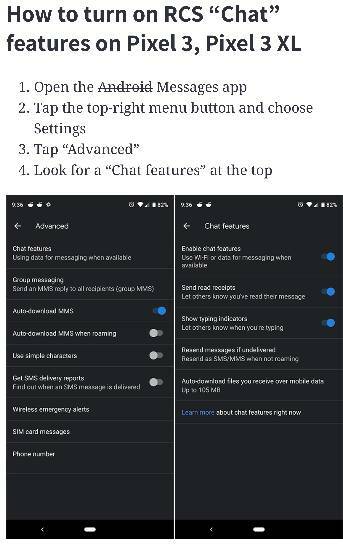 I have checked all the settings and when I tick on chat features and accept the TOS, the message comes up that I will be informed when the service is ready for me. Verizon, supervisor, informed me that RCS is only available for Pixels purchased from Verizon. Additionally, Level 1 knew nothing about RCS. Go figure. Thanks for your recounting of your experience. Alas, I must wait. There is no real difference between the Verizon model except the locked bootloader. In addition you can buy the Verizon model from Google so is Verizon claiming to exclude those as well? It is supposed to be rolled out slowly so it's probably just a matter of time. Maybe a staged rollout? I've had it several weeks on my Verizon 3XL. Right now it doesn't make much difference. I bought my Pixel 3 XL from Google. I have a Verizon SIM in it right now. I have RCS enabled on my device and can chat with someone who has a S9 on Sprint. No issues. Something must be wrong with the phone that you have if you have it enabled. RCS on the Pixel 3/3XL is not limited to just Verizon users. My friends at Verizon insist that there is nothing wrong with my phone and counsel patience. Also my friend Pam in Florida has a 3 xl from Verizon and her RCS is awaiting enablement. Perhaps a slow rollout? Yes. Also, Samsung supports RCS feature in it's native messages app, or any other android phone with android messages app installed, but it is all dependent if the carrier supports it or not. False, I have it on mine which I purchased from Google. If you do the customer chat, they can provision your line for it. I have a Pixel 3 XL purchased from the Google Store. My carrier is Google Fi. RCS is enabled. As original o p, I thought I should chime in. Patience is a virtue in this business as I now have chat features enabled. See the screenshot. Maybe this is a dumb question, but on my Pixel 3 on Fi, RCS features work sometimes and sometimes not-- do one or both people need to be on wifi or something? This is when texting with my wife who is also on a Pixel 3 on Fi. Today for example all texts are shown to be sent as SMS with no delivery or read receipts, no currently-typing, etc. And the text bubbles are lighter blue. The other day, dark blue bubbles, full RCS features. Why are most recent received text messages not showing at top of my conversation list? Recent Received Text Message not appearing on top like I used to receive.